Mátrix építőkockákkal - A Lego-kaland kritika 2014.02.05. Miért zseniális az 1947 óta létező dán játék, a Lego? Mert nem szab határt a fantáziának, bármit meg lehet belőle építeni, amit csak kitalál a gyerek. Vagy a felnőtt. Mint jelen esetben A derült égből fasírt és a 21 Jump Street rendezője harmadmagával. 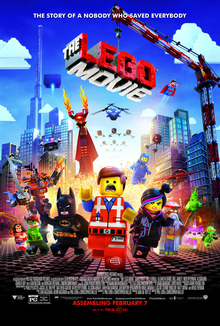 The Lego Movie is a 2014 3D computer-animated adventure comedy film written and directed by Phil Lord and Christopher Miller from a story by Lord, Miller, and Dan and Kevin Hageman. Based on the Lego line of construction toys, its story focuses on an ordinary Lego minifigure who finds himself helping a resistance stop a tyrannical businessman from gluing everything in the Lego world into his vision of perfection. Chris Pratt, Will Ferrell, Elizabeth Banks, Will Arnett, Nick Offerman, Alison Brie, Charlie Day, Liam Neeson, and Morgan Freeman provide their voices for the film's main characters. The film was dedicated to Kathleen Fleming, the former director of entertainment development of the Lego company, following her death in Cancún, Mexico in April 2013. The first film produced by Warner Animation Group, The Lego Movie was released on February 7, 2014 by Warner Bros. Pictures. It became a critical and commercial success, grossing $469 million worldwide against its $60 million budget, and received praise for its visual style, humor, voice acting, and heartwarming message. The film won the BAFTA Award for Best Animated Film, the Critics' Choice Movie Award for Best Animated Feature, and the Saturn Award for Best Animated Film; it was also nominated for the Golden Globe Award for Best Animated Feature Film and received an Academy Award nomination for Best Original Song for "Everything Is Awesome". The film has since expanded into a major franchise which ties into the Lego brand, with the sequel The Lego Movie 2: The Second Part released in 2019. The spin-off films The Lego Batman Movie and The Lego Ninjago Movie were both released in 2017, with another titled The Billion Brick Race in development. A 4D film based on the film itself, entitled The Lego Movie: 4D – A New Adventure, was released to Legoland parks across the world after its premiere at Legoland Florida in 2016. Channing Matthew Tatum (Cullman, 1980. április 26. –) amerikai színész és táncos. A karrierjét modellként kezdte. Fontosabb filmjei: Step up, Streetdance – Step Up 2., 21 Jump Street, G.I. Joe, Magic Mike, Kedves John, Mellékhatások. Felesége Jenna Dewan-Tatum. Channing Tatum, akinek ír, francia, német és indián ősei vannak, Cullmanban, Alabamában született. 6 éves korában Mississippibe költözött a családjával. Fiatalkorában aktívan sportolt: amerikai futball, labdarúgás, baseball és kung fu. 1998-ban érettségizett a tampai katolikus középiskolában. Sport ösztöndíjjal jutott be a glenvillei állami főiskolára, ezt azonban ott hagyta. Hazatért és dolgozni kezdett. Táncosként dolgozott, később pedig modellkedni kezdett. Channing Tatum was born in a small town, Cullman, Alabama, 50 miles north of Birmingham. He is the son of Kay (Faust), an airline worker, and Glenn Matthew Tatum, whose occupation was in construction. Growing up, he was full of energy and somewhat troublesome, so his parents decided to enroll him in different sports such as track and field, baseball, soccer, and football to keep him out of trouble. In the ninth grade he was sent to catholic school. It was there that he discovered his passion for football and his hopes became centered on earning an athletic college scholarship. Channing's goal was finally met, and in his senior year in high school, he was recruited and earned a full athletic college scholarship to a school in West Virginia. Tatum is also skilled in Kung Fu and in Gor-Chor Kung Fu, a form of martial arts, in which he has earned belts in both. Channing later left college and, in the meantime, worked as a construction worker, a stripper, a mortgage broker and salesman. He has modeled for Abercrombie & Fitch, Nautica, Gap, Aeropostale, Emporio Armani, and has been featured in television commercials for American Eagle, Pepsi, and some very popular mountain dew commercials. Channing can be seen on the big screen as a featured actor in _Coach Carter (2005)_ (qv), in which he plays a high school basketball player. He was also in the very popular TV series _"CSI: Miami" (2002)_ (qv) where he played the role of Bob Davenport. A Lego egy világszerte igen sikeres építőjáték védjegyzett neve. Története 1932-ben kezdődött, mára szinte nincs olyan dolog, amit ne lehetne megépíteni Legóból a több mint tízezerféle alkatrész segítségével. A Lego alkatrészek kulcsfontosságú tulajdonsága, hogy kezdettől fogva egyazon rendszer elemeit képzik: minden egyes sorozat, újonnan megjelenő készlet kompatibilis a már megjelent készletekkel. A Lego alkatrészek – mérettől, formától, színtől és funkciótól függetlenül – valamilyen módon biztosan összeépíthetők a többi alkatrésszel. Neve a dán „Leg godt!” kifejezésből származik, ami azt jelenti: „Játssz jól!”. A ma ismert, műanyagból készült Lego 2008-ban ünnepelte 50. születésnapját. John William "Will" Ferrell (Irvine, Kalifornia, 1967. július 16.–) amerikai filmszínész és író. Szinte kizárólag vígjátékokból ismert. Első bemutatkozása az 1990-es évek végén történt, amikor az NBC komédia-sow-jában lépett fel (Saturday Night Live). Olyan filmvígjátékokban játszott főszerepet, mint Diszkópatkányok, Sulihuligánok, Mi a manó?, A híres Ron Burgundy legendája, Taplógáz, Felforgatókönyv, Jégi dicsőségünk, Fél-profi és Pancser Police. Az ú.n. „Frat Pack” csoport tagja, amihez az alábbi színészeket sorolják: Jack Black, Ben Stiller, Steve Carell, Vince Vaughn, Owen Wilson és Luke Wilson. A graduate of the University of Southern California, Will Ferrell became interested in performing while a student at University High School in Irvine, California, where he made his school's daily morning announcements over the public address system in disguised voices. He started as a member of the Los Angeles comedy/improvisation group The Groundlings, where fellow cast members 'Ana Gasteyer' (qv), 'Maya Rudolph (I)' (qv) and former _"Saturday Night Live" (1975)_ (qv) repertory players such as 'Laraine Newman' (qv), 'Jon Lovitz' (qv) and 'Phil Hartman (I)' (qv) began their careers. It was there he met 'Chris Kattan' (qv) and the two became good friends and both went on to _"Saturday Night Live" (1975)_ (qv) later. He has also appeared on several television programs, including _"Strangers with Candy" (1999)_ (qv), _"Grace Under Fire" (1993)_ (qv) and _"Living Single" (1993)_ (qv) during his time at The Groundlings. Will also lent his voice to the armless and legless dad of cartoon family "The Oblongs". In 1995 he became a feature cast member at _"Saturday Night Live" (1975)_ (qv) during the show's rapid re-casting. He was declared quite possibly the worst cast member ever during his first season. However, his talents of impersonations and range of characters shot him forward to making him arguably the greatest _"Saturday Night Live" (1975)_ (qv) cast member ever. During his seven year run he is one of the few cast members to ever be nominated for an Emmy for a performance and played 'George W. Bush' (qv) during the 2000 elections. He's appeared in every _"Saturday Night Live" (1975)_ (qv) movie since his premiere on the show in 1995. In 2002 he left _"Saturday Night Live" (1975)_ (qv) and was the only cast member to ever receive a farewell from all the current cast members at the end of the season finale show. Since leaving the show Will has pursued a career in films. In 2000 he married and now lives in L.A.